NATA Syllabus 2019 Pdf: For the candidates who are aiming to appear in the NATA 2019 must be well aware of NATA exam syllabus and BArch Exam Pattern. CoA (Council of Architecture) will organize an entrance exam i.e. NATA for those students who are interested to pursue their career in the field of architecture & design. With the help of BArch Syllabus, candidates can make strategy for the exam preparation and can excel the exam by obtaining the maximum marks. In this article we have provided NATA syllabus along with the exam pattern. Candidates can also download the NATA Syllabus Pdf from here to perform better in the exam. General awareness of national/international architects and famous architectural creations. Visualizing three dimensional objects from two dimensional drawing. Creating 2D and 3D compositions using given shape and forms. Generating plan, elevation, and 3D views of objects. Perspective drawing, sketching of urban scape and landscape. Common day-to-day life objects like furniture, equipment etc., from memory. Understanding scale and proportion of objects Geometric composition, shape, building forms and elements, aesthetics, colour texture, harmony and contrast. Conceptualization and visualization through structuring objects in memory. Drawing of patterns-both geometrical and abstract. Form transformations in 2D and 3D like union, subtraction, rotation, surfaces and volumes. The exam pattern will be decided by the CoA. NATA examination will include 2 papers namely Paper-1 (Mathematics and General Ability) and Paper-2 (Drawing Test). Students will have to give both papers to clear the exam and also to obtain the qualifying marks in both papers. Candidates can see the NATA Exam Pattern here. Marking Scheme 2 marks for each correct response. To know more about NATA Exam Syllabus & Paper Pattern, Click Here. Candidates can take help of some book recommended by experts to go through every topic very well while preparing for the examination. Here we have listed some of the Books for NATA Preparation, see their name. NATA & B.Arch Question Bank by Ar. Shadan Usmani. NATA & B.Arch complete self study material: entrance examination by Ar. Shadan Usmani. A Complete Self Study Guide for B.Arch by P. K. Mishra. Arch Entrance Examination Guide by Surendra Kavimandan. Arch NATA Knowledge Bank Practice Test Papers (ENGINEERING/POLYTECHNIC ENTRANCE EXAM) by Ashok Goel. 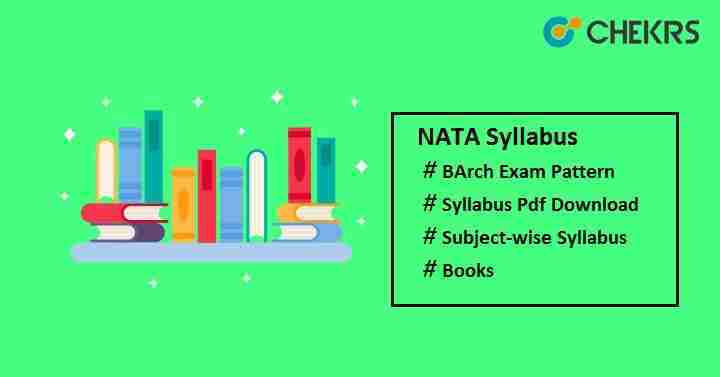 For more update on NATA Syllabus 2019 Pdf, keep visiting our site. In the case of any query, drop your question in the commenting section below. All the best!